I got the feeling that maybe the designers were just gathering scraps from various other games they had worked on? 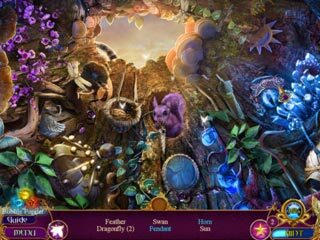 This Hidden Object Puzzle Adventure game has you jumping back and forth between earth and Anther to stop Torment in accordance with an ancient prophecy. The graphics are weird. Imagine a combination of ancient Athens, dieselpunk, floating islands, the smoke monster from Lost, the weird light-thingies that turned into rock-monsters in the Noah movie (totally not biblical, by the way), Indiana Jones, the Garden of Eden, and the Elf Land from Lord of the Rings. I got the feeling that maybe the designers were just gathering scraps from various other games they had worked on? Not much uniformity, but that’s not necessarily bad. The collector’s edition has lots of extra stuff. There are 41 collectable flowers, 18 achievements, 3 HOSs, puzzles, a nifty souvenir room, a lore book, a bonus chapter with Professor Burns' protégé, and extra media. There are four levels: casual, expert, insane, and custom. I haven’t played the first two (Tree of Life and Living Mountain), so I felt a bit lost going through this one. If you aren’t familiar with the history, I’d recommend playing the first game and seeing how you like it before moving on. If you have played and liked the first two, then, by all means go for this one as well. 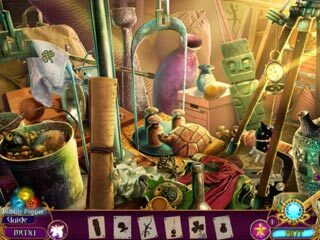 This is Amaranthine Voyage: The Shadow of Torment Collector's Edition review. Download this game here.